Now that we are onto a new season, I decided to be more adventurous with my baking obsession – doughnuts. Sometimes I wonder if doughnuts have a place in the world of “pastries” or are they in another realm of just, “doughnuts”. I have a baked chocolate doughnut recipe on the blog from a while ago, but I’ve never really tried frying dough in the kitchen, until I got a request from a friend. She has been craving for some crème brûlée doughnuts from Lucky’s Doughnuts in Vancouver, unfortunately they don’t sell them anymore. Coincidentally, I’ve got a taste of their crème brûlée doughnut last year. I just remembered it having some creamy filling and a crunchy caramel coating. The concept is not difficult to replicate, however the caramel coating is the most tricky to make, to my surprise. 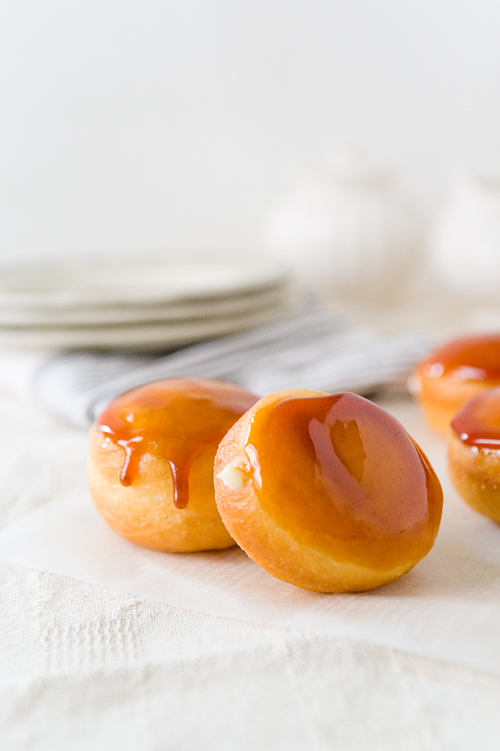 The trick is the get the caramel perfectly caramelized and dipping the doughnuts in it without burning off your fingers – that syrup is much hotter than it looks! Heat up about 2/3 of the milk with the vanilla seed and its scraped pod on medium heat. Place egg yolks, corn starch and sugar in a bowl, add the remaining 1/3 of the milk and whisk until smooth. Heat milk until warm in a microwave oven, 45 sec. Pour into bowl of a stand mixer fitted with dough hook. Add yeast and stir. Let stand for 10 min. Scrape dough out of mixer bowl into oiled bowl. Lightly oil top of dough and cover with a damp tea towel (not terry cloth). Let stand in a warm place until dough doubles in size, about 1 hour. OR cover with plastic wrap directly onto the surface of the dough, cover the bowl with another sheet of plastic, leave in the fridge overnight. Place sugar in a small saucepan, wet it with about a tablespoon of water, let it cook until it reaches a light honey colour, take off heat right away, the caramel with continue to darken more. Let caramel cool for a little, about a minute or so, carefully dip each doughnut top into the caramel, holding the sides of the doughnut. *the caramel is very hot, so use caution! Let the excess caramel drip down, and place it on a rack, caramel side up, continue with the rest the doughnuts. They are ready to serve once the caramel glaze has hardened. I had to make the caramel several times to get to caramelized to the perfect colour, I recommend NOT walking away from cooking caramel because it burns very easily and will get too dark before you know it, hence why I had to make it so many times. A good rule of thumb is cook it to a light honey colour and take off the heat, because it will continue to cook as it cools, and it needs to be cooled a bit before dipping anyways. I personally don’t mind the caramel getting a tad darker because it’s bitterness offsets the sweetness of the pastry cream inside, but feel free to experiment! 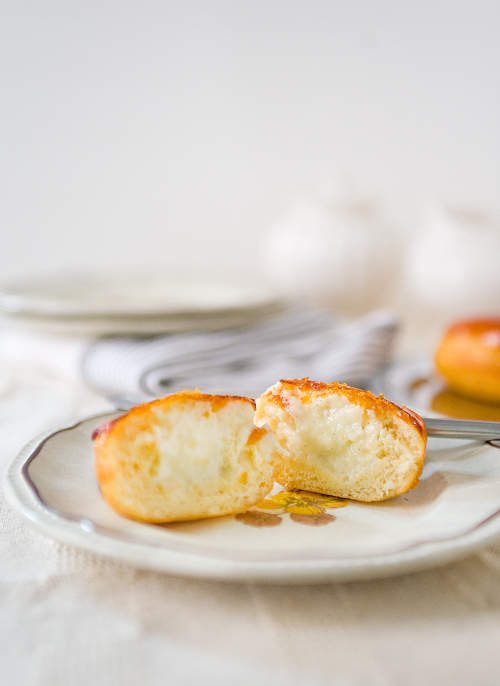 These little gems are so delicious when fresh, the crunchy caramel with the rich and smooth vanilla pastry cream inside. I never thought that I would enjoy doughnuts this much. Unfortunately the filling is made of dairy and eggs, it will need to be refrigerated if not eaten right away but the glaze will turn syrupy quick because of the humidity of the fridge. I dusted some extra ones with cinnamon sugar and they brought back my childhood memories of the carnival mini doughnuts – so nostalgic! Update July 11th: Vancouver Sun featured a photo of this recipe on July 11th’s Gastropost! Thank you! Thank you for stopping by, love the photography on your blog! Mm, spotted these on Instagram and these look fabulous! Thanks Maryanne, your blog is so cute, love it! Can’t think of anything I’d rather eat than one of these doughnuts right now. That caramel glaze looks absolutely to die for. Thank you Thalia, you’re making me hungry for one too! Absolutely eye candy! Would love to try this recipe. Thank you so much, Jo. I love them so much too! 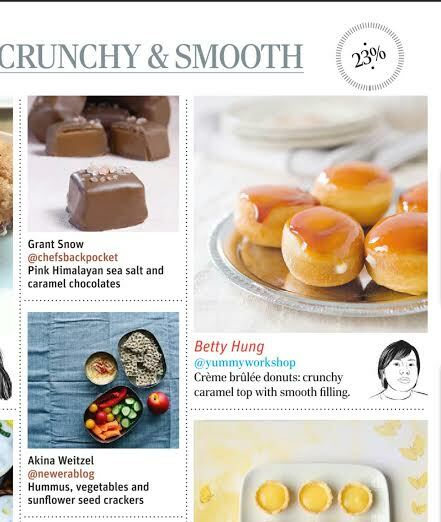 Hey Betty, you have a great selection of recipes here in your website! It’s super classy, love the idea of stuffing the doughnuts with creme brulee. Simply mouthwatering! Thank you so much, this doughnut is so good, love the creamy filling!